Bell Lightbox, the new home of the Toronto International Film Festival, will host a number of upcoming events to honour director Tim Burton. He appears in person today at 4-5:30 pm for a signing of his books The Art of Tim Burton; Burton on Burton; and Tim Burton - Masters of Cinema Series as well as his Dark Horse Journals. Today, Tim Burton launch his project Cadavre Exquis, which is a crowd-sourcing story project. He started it off with a tweet this morning. Anyone can contribute to the story at the website http://burtonstory.com. On Tuesday, November 23, he will host a master class at Bell Lightbox that is free to all students and faculty from 10am-12pm. Tickets are on a first-come, first-served basis and are available at TIFF Bell Lightbox Box Office one hour before the event start time. Seating is limited. Students and faculty must show valid university or college identification (e.g. student cards; faculty cards or faculty/administration business cards). Limit one ticket per person. Later this week on the 26th, the MoMA exhibit Tim Burton opens on November 26, 2010 and run until April 17, 2011. The exhibit will feature over 700 art works from Burton's films including paintings, drawings, puppets, costumes, storyboards and maquettes drawn from Burton’s personal vault, studio archives and private collections..
On the weekend of November 26-28 you’ll be able to see all of Tim Burton’s films back to back (to back to back to . . .) in the ultimate endurance test of unadulterated Burton love which they've called The Burton Blitz. Edward Scissorhands will have an exclusive engagement at TIFF Bell Lightbox for at least one week starting on Thursday, December 2. Cadavre Exquis or exquisite corpse is a method of storytelling by which various contributors add their own line to a continuation of a story. Any person can add to the story by referencing the last sentence visible. Tim Burton's Cadavre Exquis began with a Tweet by Tim Burton today. People can contribute to the development of the story by tweeting. All tweets can be viewed in the latest tweet tab. This storytelling adventure runs for two weeks, beginning November 22 and ending on December 6. 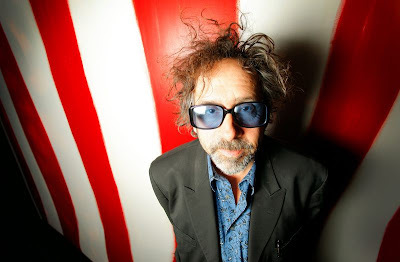 Tim Burton exhibition and retrospective opens on November 26, 2010 and runs until April 17, 2011 at TIFF Bell Lightbox. Exhibition and film programme tickets on sale now. Toronto – Director, producer, writer and artist Tim Burton makes a personal appearance in Toronto in conjunction with the launch of his major career retrospective at TIFF Bell Lightbox. On Monday, November 22 from 4 pm to 5:30 pm Burton will sign copies of the following three books: The Art of Tim Burton; Burton on Burton; and Tim Burton - Masters of Cinema Series, in addition to Tim Burton Dark Horse journals. All four items will be available on-site at TIFF.Shop. This event is open to the general public on a first-come, first-served basis. No other books or collectibles will be signed at this event and the books must be purchased at TIFF.Shop. In order to ensure that the maximum number of people are able to get their book(s) signed, autographs will not be personalized and there is a limit of two items per person. Tim Burton will open on November 26, 2010 and run until April 17, 2011. Exhibition and film programmes tickets now on sale. Visit tiff.net or call 416-599-TIFF (8433) or 1-888-599-8433 for more information. TIFF Bell Lightbox is located at Reitman Square, 350 King Street West, Toronto, Ontario. Tim Burton is organized by The Museum of Modern Art, New York. · The Art of Tim Burton – Tim Burton (Illustrator), Leah Gallo (Author), Holly Kempf (Designer), Derek Frey (Editor). A comprehensive, 434-page compilation of forty years of Burton’s artistry. Enhanced by stills from the films, storyboards, and illustrations of set designs for all his major films, Burton on Burton provides insights and information about the man and his work, throwing light on both his unique artistic vision and on the extraordinary films that have been the result. · Tim Burton – Masters of Cinema Series, Aurelien Ferenczi (Author). An essential introduction to Tim Burton’s body of work.